When it comes to coping with the effects of climate change, cities will be a crucial proving ground for adaptation efforts. Over the next few decades, the percentage of the world’s population living in urban areas is projected to increase to 67 percent – 6.3 billion people by 2050, according to the UN. But because three-quarters of the world’s major cities are located on coastlines, the growing percentage of urban residents means more people will be vulnerable to environmental stressors such as sea level rise and storm surges. “How the world adds 2.5 billion new urban residents in the coming decades is going to shape enormously the livelihoods, the wellbeing, and the environmental security of those urban residents and indeed of our societies and our economies overall,” says the United Nations Population Fund’s Daniel Schensul in this week’s podcast. Urban planning for climate change tends to focus primarily on physical threats – such as flooding and water contamination – he says. But there’s a gap in the climate community’s understanding of human vulnerability. Who is most affected? Why? What financial or social conditions build or diminish adaptive capacity? To fill this gap, Schensul suggests closer attention be paid to population and socioeconomic data, much of which can be found in census and survey results. Schensul also cautions against paying exclusive attention to the world’s mega-cities, at the expense of smaller, less capable urban areas. With 1.9 billion people currently living in cities smaller than 500,000, these secondary and tertiary cities may in fact face greater challenges to implementing adaptation programs than their larger counterparts. “The majority of the population in coming decades will continue to live in cities under a million people, and these cities are precisely those that don’t necessarily have the enormous resources, the capacity, and the ability to engage with international partners to conduct international adaptation activities,” he says. 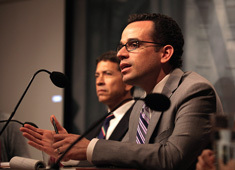 Schensul spoke at the Wilson Center on October 2. Download his slides to follow along. Sources: UN Environment Program, UN-HABITAT, UN Population Division. Summing the effects of atmospheric composition.